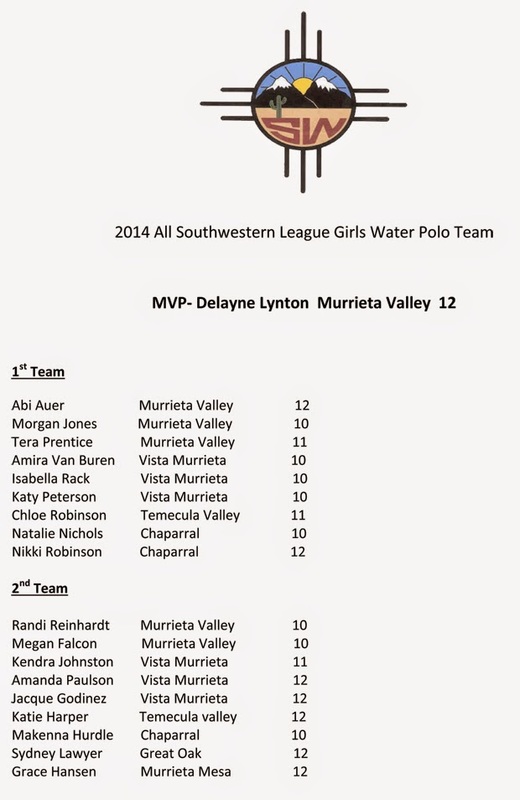 Delayne Lynton, a junior attacker for the Murrieta Valley High School girls water polo team, was named Most Valuable Player to top the All-Southwestern League team. Lynton helped lead the Nighthawks to a perfect season in league play and a 19-11 record overall, ending in a CIF semifinal loss to El Toro. Murrieta Valley placed three other players on the all-league first team. Here's the complete list. Coaches or athletic directors wishing to submit complete lists of all-league teams may do so by emailing murrieta247info@gmail.com.